Welcome to Dedicated Repair, Inc. where we have been serving our many satisfied clients for over 15 years. A family business that is kown for quality service and repair work in the northeastern Wisconsin area. Our success stems from the fairness of our rates, the quality of our services and the dependability of our highly skilled team. 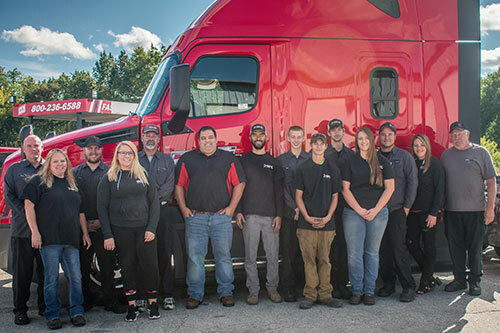 Our customers know us as a company that can be relied on and completely entrusted with the quality care of their vehicles, and that's a reputation we're proud of! Our parts inventory consists of Freightliner, Kenworth, Peterbuilt, Mack and International along with a full line of trailer parts. We also carry a complete line of Thermo-King, Carrier, Eaton, Fuller, Spicer, Rockwell and Bendix parts. Our mechanics offer years of experience in reputable tractor and trailer repairs along with Thermo-King and Carrier servicing. We have various roadside assistance services and customer support programs available upon request. Please give us a call for all your vehicle's repair and maintenance needs. We provide easy access and trailer parking just off I-43; south of Green Bay. We look forward to adding you to our ever-expanding list of happy customers.